Jewels From The Woods is a direct importer and cutter of fine colored gem stones from the United States and around the world. 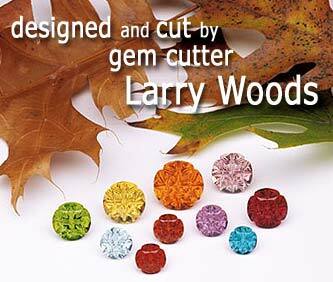 Jewels From The Woods features innovative gem cutting styles by American gemstone artist Larry Woods. He supplies unique, abstract, organic gem carvings, signature combination-cut gems, original facet design, and carved gemstone beads. The "Medicine Wheel" cut, designed and cut by gem cutter Larry Woods uses a combination of different, precision, lapidary techniques to produce gemstones of surprising brilliance and beauty. The round shape, precise angles, and a high faceted crown, combined with carved high polished grooves on the pavilion, give these gems their unique optical effect and appeal. This design placed first in the AGTA’s Cutting Edge competition, in 1991, combination cut category, earning Larry his first Cutting Edge award. 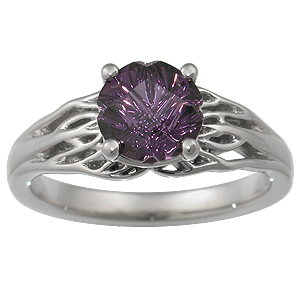 Pictured to the right is the Tree of Life Engagement Ring set with a Medicine Wheel Cut purple sapphire.